One of the most crushing feelings you can when working with lighting comes when things don’t work right. The uncertainty of where the problem is, coupled with a little confusion can make things really tough. If you’ve never encountered a DMX problem before, be prepared to be a little confused. Unlike a power problem, a DMX problem isn’t so simple to diagnose. 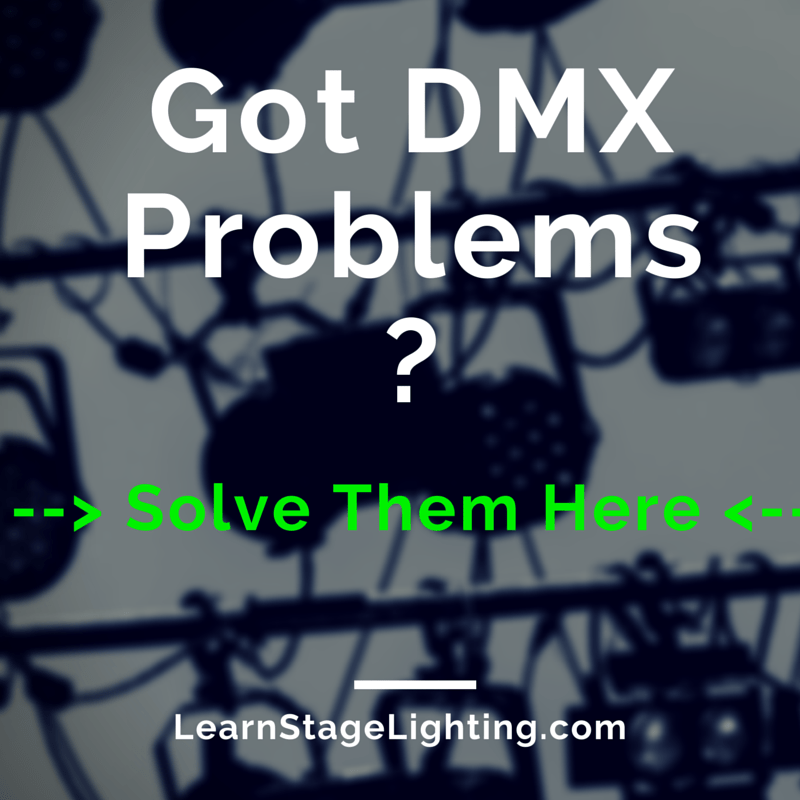 However, with a few tricks, it can be simple to diagnose and fix your DMX issues pretty quickly. When you’re having a DMX problem, some your lights may begin to flicker or stop working. However- this does not mean the problem is with the flickering lights OR their cables – the problem may be on the clear other side of the DMX chain! Or, perhaps you lose data completely – though this is likely just a unplugged cable. Another symptom you may find is that certain lights may have gotten DMX data, only to drop it and be stuck in a color. All the while, the DMX indicator lights on the back of fixtures may be illuminated – while they’re helpful, they are also sometimes wrong when signal is weak! The first step in finding a DMX problem is to check your console’s patch and the fixture’s modes/addresses. Also, ensure that the console’s Grand Master and any other masters are where they should be. If your console has a “output” screen that you can view, pop that up and check it as well. Make sure that everything matches up the way that it is supposed to, and that it’s all plugged in to the proper universes. Then, whip out the manuals for your fixtures to be sure the modes are set right – if I fixture is supposed to be in 4 channel mode, but it’s actually in 7 channel mode, then you’re going to have problems! If you’ve had your rig setup for awhile and not changed anything, then you can skip this step and move forward to checking your cables – the cause of most DMX issues! Regardless of your DMX problem, there are a few tricks we can use to narrow it down. The first thing I like to do is to give my fixtures some active DMX, so I can see when things stop working. Choose a chase that is fast enough that you can track it and see when things become problematic, but slow enough that it doesn’t drive you nuts! I like to run a static color with a chase in a different color across all of my fixtures, and I usually run it at about 25% intensity. This gives me enough light to see what’s happening, but not too much that I’m blinded. It also gives me a quick chance to check that the lights are in the correct addresses and placed in the proper places. As I alluded to above, the DMX indicator lights on fixtures aren’t always 100% accurate, and that is why I run a chase across the fixtures – to make sure they are actively responding to data. Then, do a quick walk through the problem area of your lighting rig and make sure nothing got unplugged. After that, begin unplugging fixtures, beginning with the last fixture in the chain. When the problem stops, replace the last cable that you unplugged – but don’t mark it as bad yet! The next thing to do is to re-connect all the cables and see if the problem stays away. If you touch a cable and everything begins to work again, try gently wiggling the jacks where the cable is plugged into the lights and also the cable itself – it may then present itself as a bad cable or as a bad connection in the fixture’s jack! By re-connecting all the fixtures, starting at the problem, you are also able to see if/when the DMX gets too weak from having too many fixtures connected. You’ll soon know if the cable was bad or not! As we talked about in “How to Wire DMX”, you shouldn’t make a habit of going over 16 fixtures in a DMX chain because the signal may get too weak. While DMX problems are almost always due to a bad cable, bad fixtures can cause you problems as well. So, if the above didn’t work, try skipping the fixture that seems to be in the problem spot of the chain. Always verify that the problem fixture is set to the correct mode and address. Some fixtures have stand-alone modes that shoot out DMX to other fixtures, causing a host of problems! If you’ve checked those parameters, but the problem still exists, then you’ve likely got a problem fixture. At this point, you can try to plug just that fixture straight into the console, and see if it’ll respond. If it does, you can run in it’s own output from your opto-splitter and run it until it dies (which it likely will with time, as the DMX card is probably going). Having it’s own run out of the opto-splitter will also isolate the light from sending any bad DMX to other fixtures, which is a plus. If the fixture in question does completely stop working with DMX, you can always try to contact the manufacturer to get it repaired – cheaper fixtures may not be repairable for a reasonable cost, but it never hurts to ask. Great article! But doesnt quite solve my problem. Ive got a basic set up using a Chauvet Obey 10 and 4 generic LED stage lights. When I set the lights to cycle colors, the last light on the chain is either the start of the cycle or the end but it is never synced with the rest of the lights. I switched cables and the problem persists. Otherwise Im pleased with my investment. Are you using DMX cables, or Mic Cable? This sounds like a DMX signal strength issue, which can happen when you use mic cable instead of proper DMX cable. If that isn’t your issue, it could be an issue with one of the lights “sucking” a lot of DMX juice out of the system. Try grabbing a DMX terminator and plug in into the last fixture – it may help as well. It’s always best to use DMX cables, though XLR cables often will work, it’s not guaranteed. Your problem may be the cables, or it may be something else – I would get the cables right first, and then troubleshoot further. I’ll try to describe my pblm and hope you’ll understand. My set up is in a theatre and consists of 13 Leds (Cameo, 3 different models) + 4 8ch SGM dimmers + 2 (not so good) 6ch dimmers. The 4 SGM dimmers have 30 fixtures mainly PCs and PARs plus some old Profiles. I run a chain of dmx cables from the 1st Led through the last cheap dimmer and terminate this with a classic XLR terminator. Usually i use an ENNTEC dmx-usb adapter from a laptop running QLCplus to play my scenes. Without any obvious reason and not in regular time, a flicker to all lights begins that only stops if i unplug the dmx from the ENNTEC and leave it for some minutes. After that if I plug it again there is a chance to start flicker again after some minutes or be lucky and finish the show. This is happening for about 3 months now and I’ve tried many things. I have 24 inputs connected to my lights but only 12 of them are working. (i have a controller with to rows of 12 slidy things) is there a way to make the other 12 work? It’s likely there is a switch, fader or setting on your console that you need to adjust. Reference the manual of your specific console to see what it is!